One specific weekend in autumn 2010 was full of death and metal. 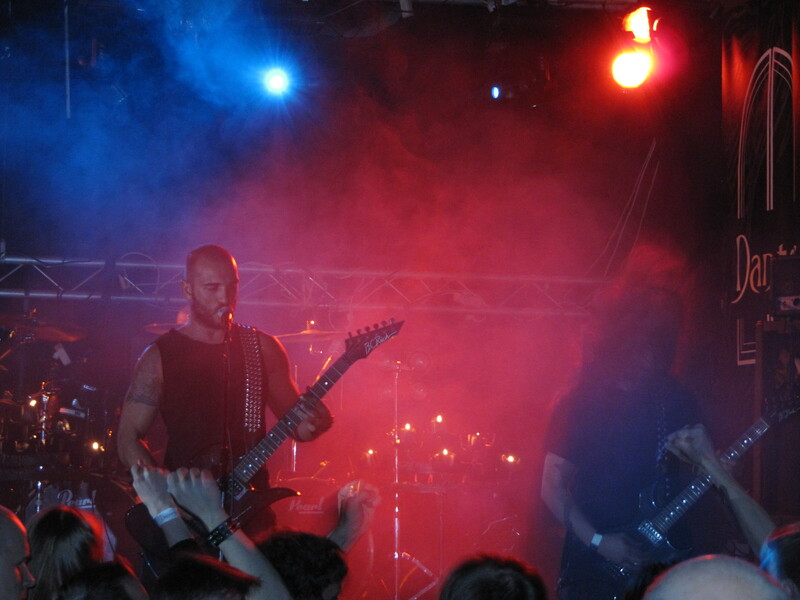 Helsinki was sliced, beaten and crushed by bands like Sadistic Intent, Necros Christos, Demigod and Cruciamentum. The happening was called Black Mass Ritual Fest III, and although it feels like every daily rehearsal in parents’ garage is called ‘ritual’ nowadays, this feast included bands whose gigs can really be concerned as rituals. One of them was Dead Congregation, whose most powerful tool is their music. No need for corpse paints, blood, spikes and incenses – just that oppressive wave of noise that pounds you into the trance. And that’s how it went in Black Mass Ritual too. Tight but still raging, like a slaughterer who is doing his job – but also enjoying of it under the surface. And that’s what a ritual is about: it has its rules and formulas but the spirit and devotion must be present too. So, let’s start with the basic question: what new or special does a live performance bring to your music in your opinion? What kind of new territories you or/and an audience can reach? – It is a more direct way to connect with your audience since listening to a band’s album through stereo speakers is more impersonal than watching the band perform the songs live. From the band’s point of view there’s a certain energy on live concerts that is very different than when rehearsing for example and it’s something I cannot explain because it’s not a conscious poser show that depends on the audience’s reaction. When Dead Congregation are on the stage the Beast is unleashed and the band members are in trance, not fully aware of our surroundings. You can receive a warm reaction from the crowd or a great vibe from even a still audience that is subdued by your music/art and that certain aura that flows in the room of a live concert is absorbed subconsciously and is what triggers the manifestation of the forces within. One interesting point in live performances is that the band brings their personal creation audible for the other people, which are some sort of outsiders after all. So, music as a personal and intimate creation and on the other hand as a shareable experience – do you find any contradictions in this? – Creating music IS personal in the sense that honest bands/musicians compose without keeping in consideration what others will think of their Art, they just do what comes from their hearts and soul. Nevertheless, bands do want to share their Art with others and that’s why we record our compositions, make them available to the public and play live. Whoever claims that doesn’t care at all about others might as well remain in the rehearsal room and never share their compositions with no one than the band itself, right? Speaking for DC, the best for us would be to share our intimate creation not with many outsiders but with people who have a clue about the essence of our music. That’s why we always choose to play gigs with our peers and why we refuse to sign to any big label. – I believe I explained that on the first question. Death and black metal is spiritual music above all, there are far greater things in the mould than riffs, drums and vocals. Some need tools to achieve the higher state of trance, some don’t but in the end it’s all about letting go and leave your inner forces guide you when you perform otherwise it’s just fake. When talking about live performances the usual topic is the contact between the band and the audience, but I’d like to discuss about the other contact – the contact between the band members. How would you describe the dialogue and connection between you and the other players (and the importance of it)? – That is a very important factor indeed, there must be a strong bond between all members so that the band is a unity that works effortlessly. There should be no explaining in the band about obvious matters and dialogue on stage should be kept to the minimum. Dead Congregation is a solid to the core and not a gathering of session musicians. And when you go to see a metal gig, what kind of things do you demand from a band? How would you describe a good live performance, and of course if you can tell something about the most memorable gigs you have witnessed, we are all ears! – I expect honesty from the band, seeing them perform with hunger that comes from within and not simply posing to satisfy the crowds. It’s not about how great you perform and how skilled you are as a musician, everyone can become good by practicing countless hours but if there’s no spirit and atmosphere in the performance then it’s just an empty show. Most memorable gigs the past few years are Autopsy and Suffocation at Hole In The Sky this year, Grave Miasma and Cruciamentum every time I see them and to my great surprise Metallica at this year’s Sonisphere! I cannot pin-point what it was that made those gigs special other than seeing bands performing with integrity and PASSION! Ok, Metallica also had a great stageshow and the best live sound I have ever heard in my life, haha. So, after a couple of weeks you are climbing to the stage in Helsinki. What kind of expectations do you have for this festival – are there maybe some bands which you are waiting eagerly? And what kind of a gig can we expect from Dead Congregation? – We never have any expectations beforehand regarding the moment we perform, once we plug in and start the first notes of our set things go to another dimension and it’s out of our hands really. You can expect a no-gimmicks, no-frills, only DEATH Metal with spirit performed in your face with passionate intensity. – Regarding the festival in general it will be a nice gathering of friends and I definitely look forward to ALL the bands actually, the line-up is just incredible!